While North America is in its infancy in mass timber use, Europe is well into a second-generation of Cross-Laminated Timber (CLT) manufacturing equipment and methodology. Access to this new technology is accelerating North American adoption and changing the way in which we’re likely to see our industry evolve. 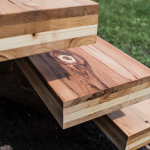 Mass timber has the potential to become the core structure for almost every type of building, across all industry segments, but it will take years, decades, perhaps a century or more, to realize it. That degree of adoption cannot happen from the top down. Large, high-investment manufacturers will not be able to supply CLT across the country economically or competitively. It’s simply too expensive to ship long distances. Lower cost CLT manufacturing equipment is removing the barrier to entry and what we’re likely to see are mom and pop-type CLT plants sprouting up all over North America with a narrow geographic focus using a new generation of vacuum versus hydraulic press, and modern methodology. It’s already happening. Methods: First generation CLT panels are made with cross laminated layers of 2” x 6” dimensional lumber and a hydraulic press. The press is a complex, heavy, highly automated piece of equipment that applies pressure on the stack of layers until the glue between layers sets. The press requires a lot of space and a thick concrete foundation to sustain force. Glue is used between each laminate layer, but not between the 2 x 6s, which lay side by side. 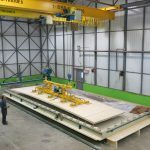 Second generation CLT manufacturing methodology introduced “Panolam” and a vacuum press. Panolam are prefabricated single layer panels up to 2.95m wide by 16m in length, made up of strands of wood (lamella) that are edge-glued. In other words, glue is used not only between the layers of Panolam panels but also between each lamella. A vacuum press is like a large rectangular flat bottom bathtub with a large, retractable, rubberized membrane on top which creates a vacuum seal. Vacuum presses are simple, light, largely hand-operated, and do not require a heavy foundation or a lot of space. Air is drawn from the press to create vacuum pressure on the stack of Panolam. 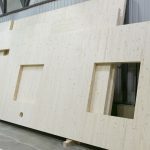 Appearance: One of the key advantages of CLT over other construction materials is the fact that it is both a structural member as well as a finished surface. Often, however, owners and architects demand a better looking visible surface than that which is available in the form of 2 x 6 dimensional lumber. Though subjective, Panolam are much more refined in appearance and edge gluing helps ensure that there are fewer, less visible separations between lamella and checks (or cracks) on the surface of panels. Versatility: Hydraulic presses are designed for one purpose, to produce standard CLT panels as fast and efficiently as possible. 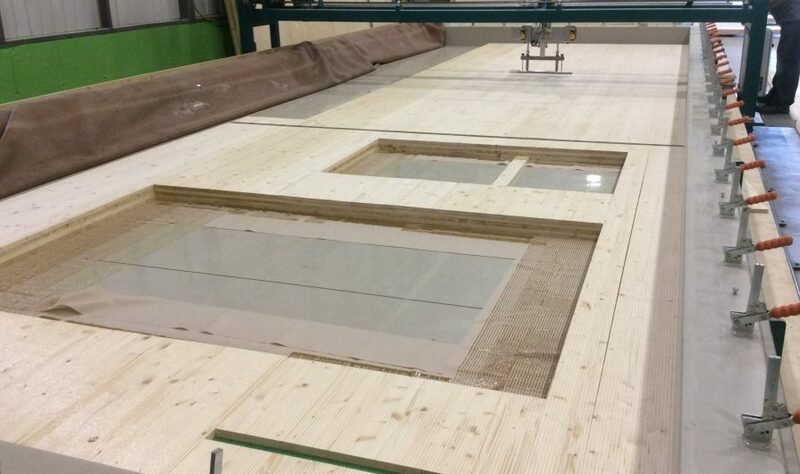 With a vacuum press, manufacturers can produce a multitude of different CLT panel types. 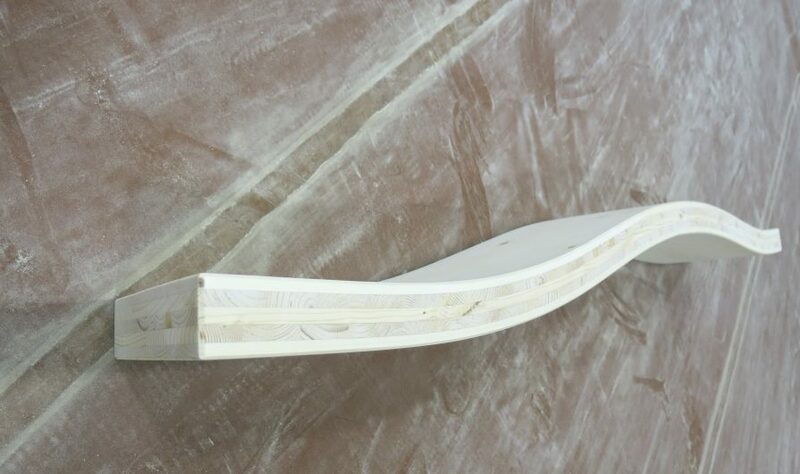 For example: using a mold, manufacturers can produce curved CLT. 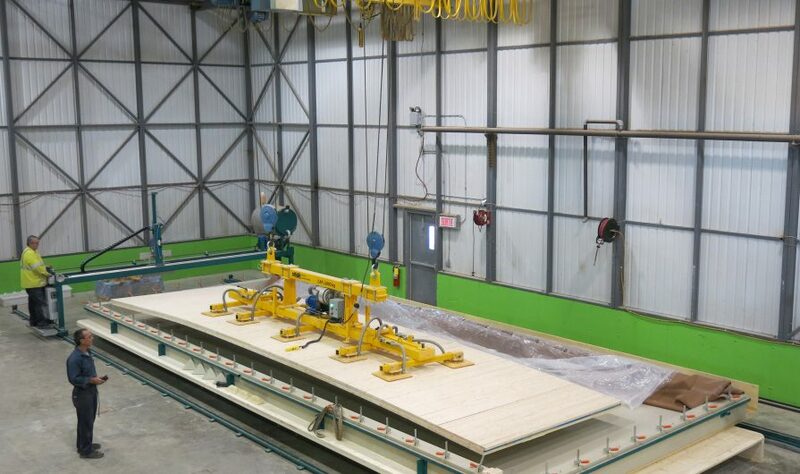 Innovators are using vacuum presses to create new types of panels such as “CLIPs” – Cross Laminated Insulated Panels. 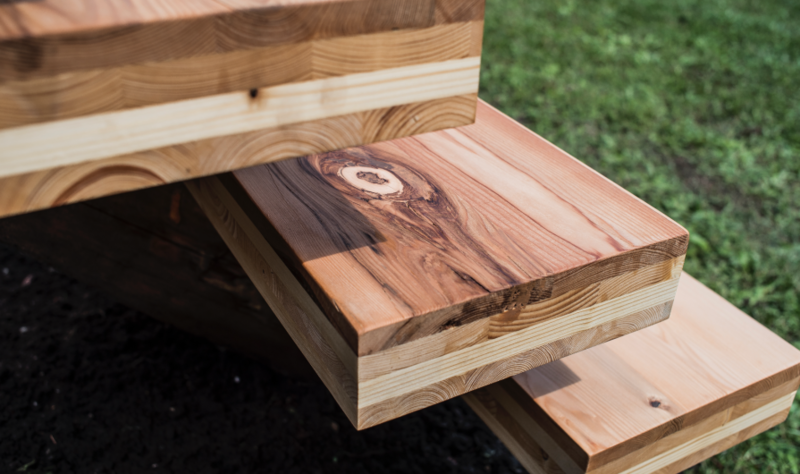 For those customers who require high-quality visible surfaces, a vacuum press can be used to adhere virtually any type of wood species as a decorative layer to the surface of a CLT panel for walls, countertops, stair treads, custom furniture, etc. Variety of Thickness: First generation CLT panels were made with 35mm-thick dimensional lumber. Later, 17mm-thick lamella were introduced. Panolam, on the other hand, is available in 20, 30 and 40mm thickness. 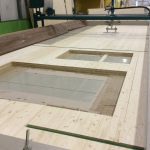 Whereas first generation CLT manufacturers offer eight or nine variations in panel thickness, second generation manufacturers offer 36 or more variations ranging from 60mm (three layers of 20mm Panolam) up to 400mm in increments of 10mm. 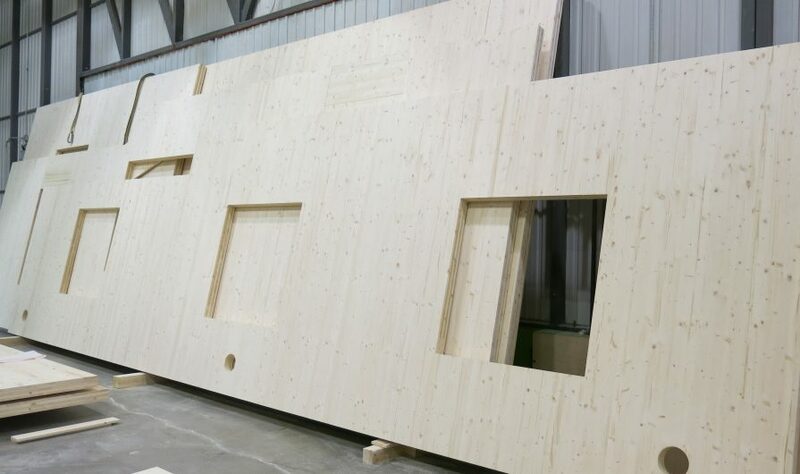 Since the volume of wood in a CLT panel impacts price, engineers can optimize layups to more precise requirements reducing wood volume and cost. Electrical Chases: First generation CLT manufacturers produce and sell “billets” – slabs of cross-laminated solid wood panels without openings. 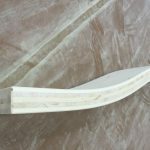 Although holes can be drilled into panels to create chases for electrical wiring, it’s problematic to do so once a billet has been pressed, and designers are forced to conceal wiring otherwise mounted on the surface of panels. Vacuum press methodology differs. Manufacturers can stop at each layer in the panel layup process and leave out Panolam where chases are required for electrical wiring. In other words, chases are typically built into panels and wiring is concealed within. 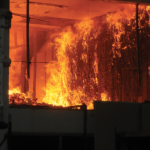 Waste: Though the billet layup process is much faster using a hydraulic press, involving less manual labor, the industry is challenged to find aftermarket uses for the portions of billets removed for window and door openings and customers who buy billets versus panels end up paying for the wood removed. Cost: Fully automated CLT manufacturing lines can cost $10 million to $25 million or more depending on the degree of automation. Today, you can buy a vacuum press for approximately CDN $375,000. Anyone wanting to “get in the game” can be producing panels with a vacuum press and framing them by hand for approximately $1 million, excluding the cost of the building. 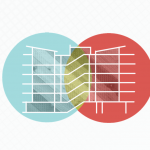 Market Positioning: First and second generation CLT manufacturing methods have their place. Early adopters brave and bold enough to have pioneered CLT in North America now have an established market. They’re the ones producing the 13- and 18-story buildings. 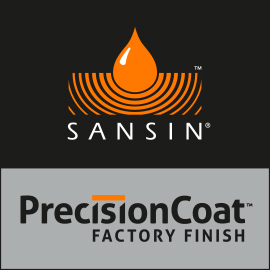 Production capacity for such a market is critical and speed of fabrication is paramount. Hydraulic presses and CNC equipment serve them well. Tall wood building opportunities, however, are few and far between, at least for the time being. The rest of the market is evolving from the bottom up. It’s wide open and likely to be dominated by local producers. Brave owners and architects, also willing to explore mass timber, generally prefer to start with small, more manageable, less risky projects and work their way up with experience. This market is well served by new technology which allows local manufacturers to start small and scale up as the market matures. Grass Roots Evolution: Regardless of capacity and speed of production, CLT is expensive to transport across long distances. In addition, many of the owners and architects interested in working with mass timber ask for locally harvested wood for many reasons including LEED certification. Every state and provincial government is mandated to create jobs and establish markets for their own forestry industry, and are prepared to invest in homegrown companies that can help make that happen. In an emerging market, CLT manufacturers can mitigate risk by using low-cost manufacturing equipment that serves many purposes, equipment that can be used to produce a variety of different CLT products. They also need to be flexible and adaptable to the requirements of small to medium-sized, unique projects. Many may not realize it yet, but a revolution in the use of mass timber in construction is upon us. When it takes hold at the community level, the heart and soul of the movement will be revealed. 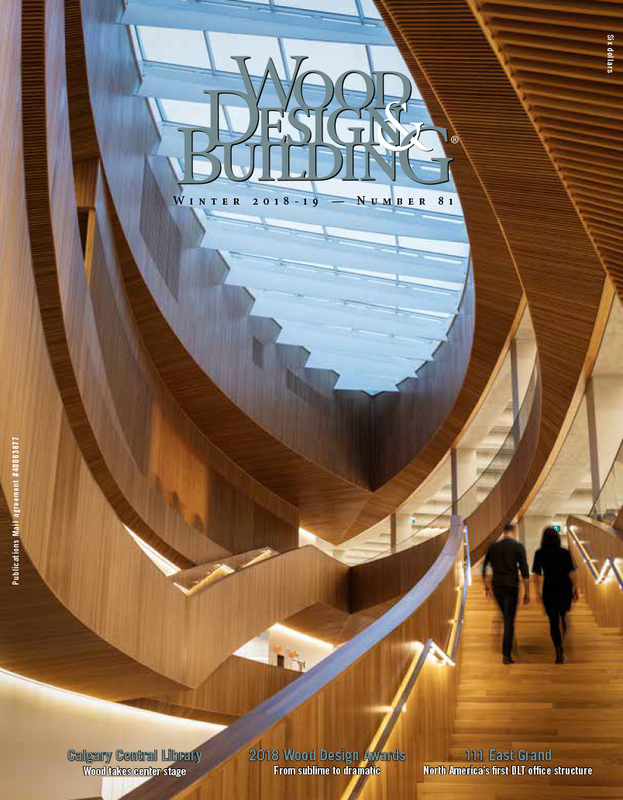 The innate human desire to connect with our space, to connect with nature, will manifest in the form of beautiful buildings made of wood, using locally harvested material, fabricated by local producers, and assembled using local labor. Patrick Chouinard is the Founder and CEO of Element5 Co. Inc. and an advocate for greater use of wood in construction. He can be reached at patrick@elementfive.co.